Blog time again, and wow what a busy time it’s been since my last update! 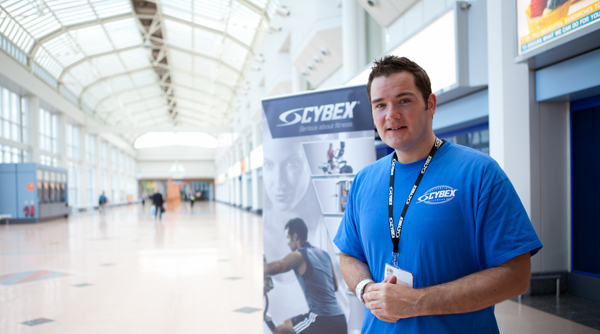 Last month I was fortunate enough to attend Leisure Industry Week in Birmingham as part of the CYBEX team. It was so lovely to meet all of the gang from the UK and indeed some from further afield! I can genuinely say that they are a fantastic team of people who have such a passion for their brand and what they do. One of the highlights for me was speaking to a lady who suffered from arthritis and wanted to start using exercise equipment at home. I spoke to her about the 360A home Arc Trainer which I use and discussed how she could use this safely and efficiently, without exerting any excess pressure on her joints. She tried it out on the CYBEX stand and loved it – she said it was one of the first machines she had used which didn’t cause her pain. It was so rewarding for me to be able to teach people about CYBEX equipment, supported by what I have learned in my studies to become a personal trainer. I was also blown away by the amount of people who came up to say hi and ask for pictures – so thank you all. You can click here to see an interview that I did with CYBEX’s Ben Wilde whilst I was at the show. In my last blog I spoke about taking exams for my personal training qualification and I am delighted to say that I have recently got my results and am now a qualified Personal Trainer & Advanced Fitness Instructor. I have also completed and passed my National Certificate in Step. This has been such a huge achievement for me, as a year ago I would have been the last person you would have found in a gym, and yet now, here I am not only as someone who looks forward to a workout, but who can now help others to achieve their goals. My motto for my personal training is simple; ‘believe, and you will achieve’. I firmly believe that all of the good things that have happened over the past year are as a result of my new found positive outlook on everything I have set my mind to and I can’t wait to start sharing this with my clients. The new series of the Biggest Loser has also started filming and I have been lucky enough to go and visit the set during filming – all I can say is WOW, I thought our season was gripping but the new one will be amazing! Watch out for it coming to your TV screens in January. On a final note, I’ve just launched my new Facebook page so please feel free to have a look: www.facebook.com/ptpaddy.